With this guiding principle and the goal of promoting the positive development of renewable energies, energy savings and future energy supply, which will benefit our children, future generations and our environment, further processes will also be electrified in the future. In the future, electricity storage facilities will play an important role in this design of energy supply. In 2010 the thoughts on the topic of energy storage systems will be integrated and implemented together with ENPLA GmbH, Christian Joos and Marco Schmidt. 2011 Solutions on the subject of SmartHome, CHP and the E-SpeicherWerk at the InterSolar trade fair in Munich arouse lively interest. 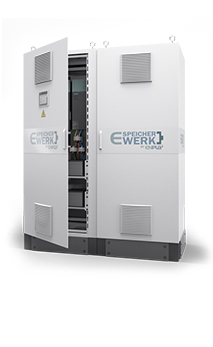 2012 is the first time that the E-SpeicherWerk will be an independent brand at the InterSolar in Munich. The first 1 MW Li-Ion memory is produced in the production facility for delivery. 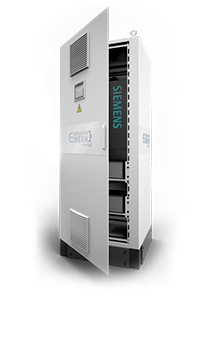 2013 the first local network storage facilities based on Li-Ion cell technology with active BMS are manufactured and connected to a virtual power plant. 2014 The E-storage plant with its individual energy management and off-grid functions will be implemented in large numbers in agriculture. Hybrid energy supply systems in combination with CHP, emergency power or wind power plants are realized. In 2015, the first modular 5MW E-storage plant based on container solutions is built and successfully prequalified as a stand-alone unit for participation in primary control energy. In addition, the first fully self-sufficient apartment building without electricity and gas connection will be equipped with an innovative battery store. In 2016, a concept for customer areas combined with electric mobility for eCar and eLKW charging infrastructure will be implemented for the first time. Roof photovoltaic systems and PV trackers are integrated into the charging infrastructure of a forwarding company. This forms the basis for the future challenge of electrical drive technology. An electric storage plant with an output of 500 kW and 500 kWh capacity was integrated with an energy management system to optimise supply and additionally participates in the control energy. A 2.5 MW electrical storage plant was installed at the plant site so that customers can also inspect the plants directly at the plant and provides primary control energy for the transmission grid operator tennet. In 2017, further megawatt projects with the electricity storage system E-storage plant for primary control energy were realised and successfully prequalified. 2018 Concepts for the application of hybrid networks will increasingly become the focus of post EEG plant operators in the future. Here Pfenning has implemented technical requirements in first projects for energy suppliers in the combination of sector-coupled energy contracting with heating, cooling, electricity and emergency power with the integration of electric charging systems.